How did Spain's activist-politicians first get onto the ballot paper? Spain's media should take note - through their roots in prominent local struggles and willingness to spearhead radical democratic participation. On Sunday, May 24, the two parties that have ruled Spain since the country’s transition to democracy in the late 1970s were dealt yet another substantial blow, this time in regional and municipal elections. Nationwide, the ruling Popular Party saw support fall from the nearly 11 million votes they received in 2011 to just under 6 million this year. But while much has been written about the impact emerging parties like the anti-austerity Podemos or the right-wing Ciudadanos have had on the established parties, what makes Sunday’s results so remarkable is not what those parties did on their own, but what happened between several political actors at the municipal level. In Barcelona, the prominent anti-evictions activist Ada Colau won the city’s mayoral race. In Madrid, once a stronghold of the Popular Party, the former judge Manuela Carmena also has a chance to govern, depending on whether her platform and the deteriorating Socialist party are willing to strike a deal. In the four largest cities, it is quite possible that the mayor will belong to neither of the two major parties. The same is true in Galicia’s major cities, Santiago and A Corunha. In Cádiz, Spain’s unemployment capital, another new, anti-austerity platform finished a close second. Much of the right-wing Spanish press is already attributing these spectacular results to a cult of personality around the people leading these platforms, accompanied by the typical references to populism and Venezuela, with an occasional shout-out to North Korea for extra flavour (as if the resort to these arguments weren’t the epitome of populist rhetoric). What they ignore is why those faces became famous enough to put on a ballot in the first place: their roots in prominent local struggles, their independence with respect to the established parties and their willingness to spearhead bottom-up processes seeking a confluence between new or smaller parties, community organisations and political independents around a set of common objectives determined through radical democratic participation. 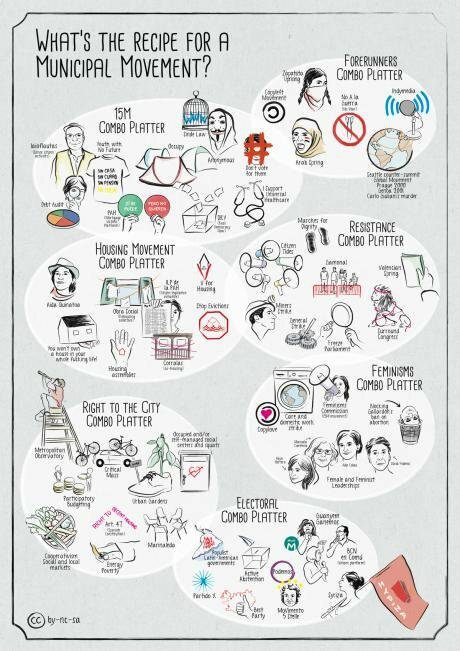 The Spanish hub of the Doc Next Network’s Radical Democracy: Reclaiming the Commons project has been documenting this process since it began, through video and other media. Below, you can see a helpful infographic that shows just some of the ingredients with which the new municipalist candidacies Ahora Madrid (Now Madrid) and Barcelona En Comù (Barcelona in Common) cooked up their municipal recipes. They include more obvious reference points like the indignados movement, but also feminist struggles, the copyleft movement or the Zapatistas of Chiapas, Mexico, among many others. Radical municipal politics is not an altogether new concept, especially not in Spain. In Catalonia, the Popular Unity Candidacies of the left-wing independence movement have had a notable presence in smaller towns for several years (they also quadrupled their 2011 results on Sunday, for what it’s worth). At the southern end of the country, the Andalusian village of Marinaleda is a well-documented experiment in utopian communism that has been going on for over three decades now. In fact, the so-called father of libertarian municipalism, social ecologist Murray Bookchin, was strongly inspired by the Spanish municipal politics of the 19th and early twentieth century, as well as the Swiss Grey Leagues and the New England townships, when he wrote his influential “New Municipal Agenda”. While he hardly intended to prescribe a one-size-fits-all solution—especially not in large urban belts and port cities—in the text, Bookchin outlined four main coordinates: a revival of the citizens’ assembly, the need for confederation with other municipalities, grassroots politics as a school of genuine citizenship and the municipalisation of the economy. Underlying all of these coordinates is “a recovery of a new participatory politics structured around free, self-empowered and active citizens”. All of these coordinates chime with the program and praxis of the new municipalist candidacies. In the newspaper they handed out as part of their campaign, Barcelona En Comù used almost as much space describing their process (30,000 signatures asking them to run for election, 1,000 campaign volunteers, 200 events organised by self-organised neighbourhood assemblies, 100 meetings with various community organisations in just 10 months of existence) and their vision (“a standard-bearer of social justice and democracy”) as they do outlining their program. The program itself includes 600 measures, ranging from modest but much-needed reforms (e.g., opening up more bike lanes, more social housing), to more radical ones (a guaranteed municipal income, coining a municipal currency). Several questions remain about the conflict between the ambitions of the new municipalist candidacies and the daunting, path-dependent inertia of an institutional reality that threatens to swallow them whole. Many of those questions are addressed by some of the candidates themselves in the film Municipal Recipes, which you can watch below. In it, they discuss the thought process that led them to make the jump into the electoral arena, how they hope to care for the city, how to make it liveable, the relationship between citizens, social movements and institutions, and the pitfalls of representative democracy, among other key issues. It’s a fascinating glimpse into a remarkable process. Tellingly, one of the most frequently used words in the film is “tension”. As Pablo Carmona of Ahora Madrid puts it, regardless of whether they achieve something like Bookchin’s New Municipal Agenda, they have opened up “a new model of social conflict” in Spain. Recetas municipales. Una conversación sobre el cuidado de las ciudades from ZEMOS98 on Vimeo. Municipalrecipes.cc is a campaign carried out by Lucas Tello, Nuria Campabadal, Mario Munera and Guillermo Zapata, coordinated by Sofía Coca.